Postman has been and he has brought this months Loot Crate, I was worried it wasn't going to get to me as the postcode was wrong on the address but this only delayed the Crate a few days. If you don't know what Loot Crate is, it's a monthly subscription box that sends a box of geek goodies every month, it's an American company so the box is sent from Los Angeles and costs around £18 per month ($29.99). I only signed up to Loot Crate last month because it was VILLAINS month and I decided to keep my subscription for this month as it was HEROES month. Recap on last months Loot, I was very impressed with the VILLAINS crate mainly because of the t-shirt that was included. 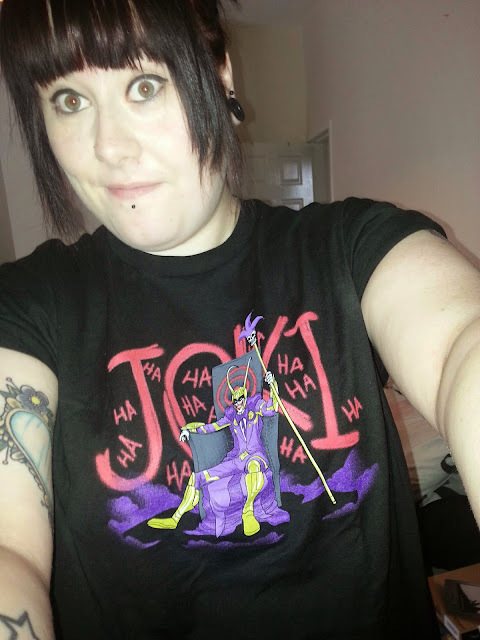 The tee was a mash up of the Joker and Loki which are 2 of my favourite villains. 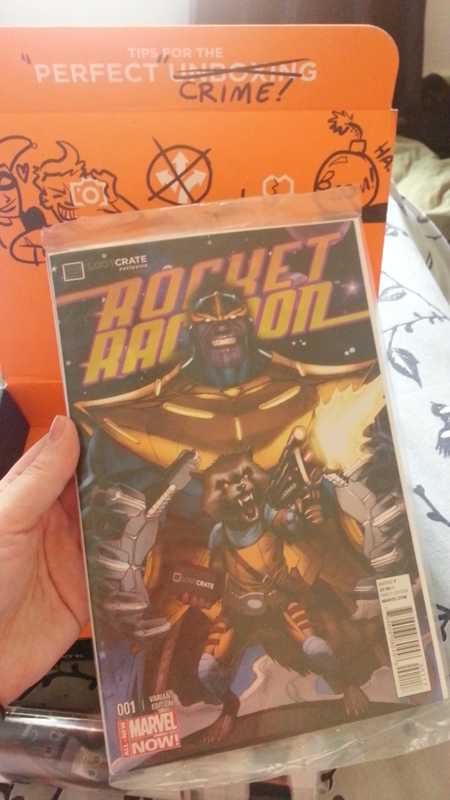 Other loot in the crate was Joker and Harley Quinn posters (A4 size), Deadpool socks, Darth Vader key ring, Bowser magnet, Necessary Evil documentary DVD, an Loot Crate exclusive Rocket Raccoon comic and the usual themed badge and magazine. So after the awesomeness of last months crate I wasn't going to miss out on this month and I'm so glad I didn't. The August crate also had an exclusive item in it and I already new that it was in the form of a Funko Pop Vinyl figure. 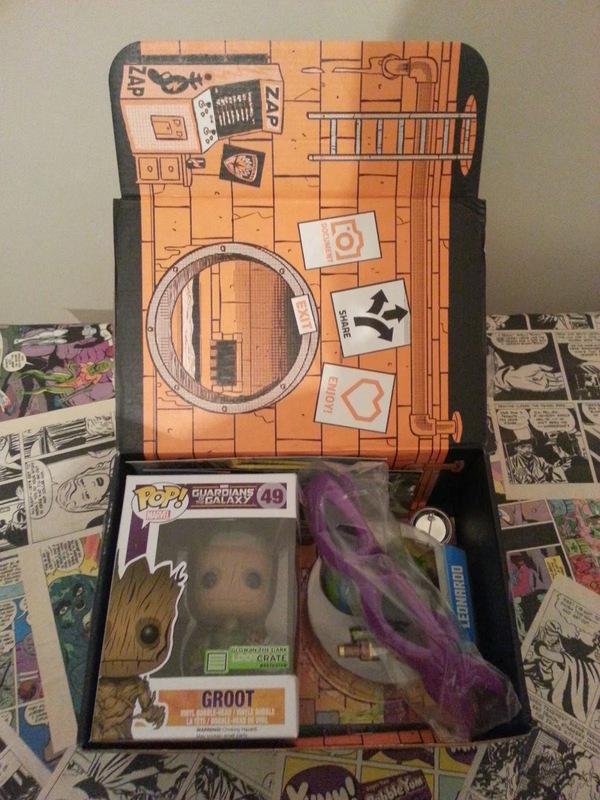 Opening my crate to find Funko Pop on the top was so cool, it's an exclusive glow in the dark Groot figure! I went to watch Guardians of the Galaxy as soon as it was released at the cinema and I loved it, I am currently collecting the Funko Pop GOTG figures so adding this exclusive to that collection is great. Also in the box this month is a Kidrobot item, I have a small interest in Kidrobot items I have brought a couple of his Dunny figures in the past. 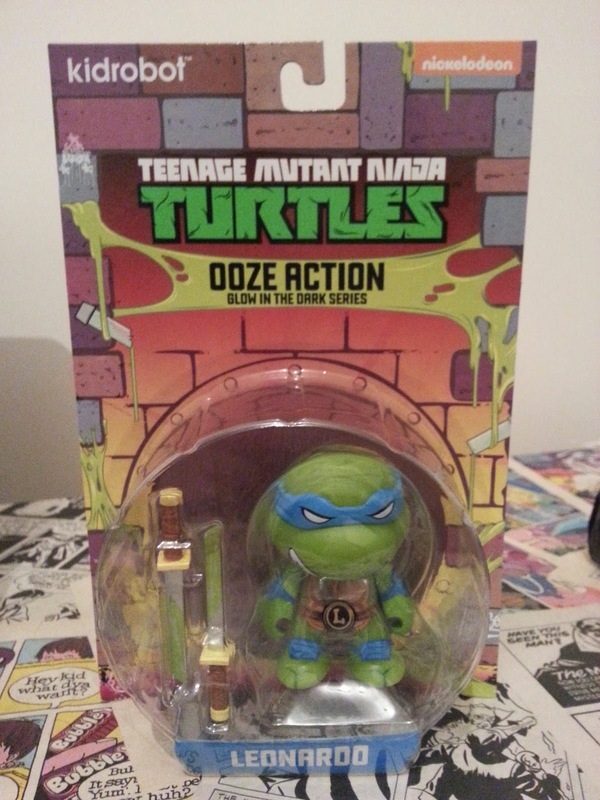 However this being heroes month the item was a glow in the dark Turtles figure (I got Leonardo) I thought the figure was pretty cool it will be staying in the packaging and being put on a display shelf. There was another Turtles item in the crate, funny glasses that make you look like your wearing the eye masks which the Turtles wear. (I got Raphael - Purple). 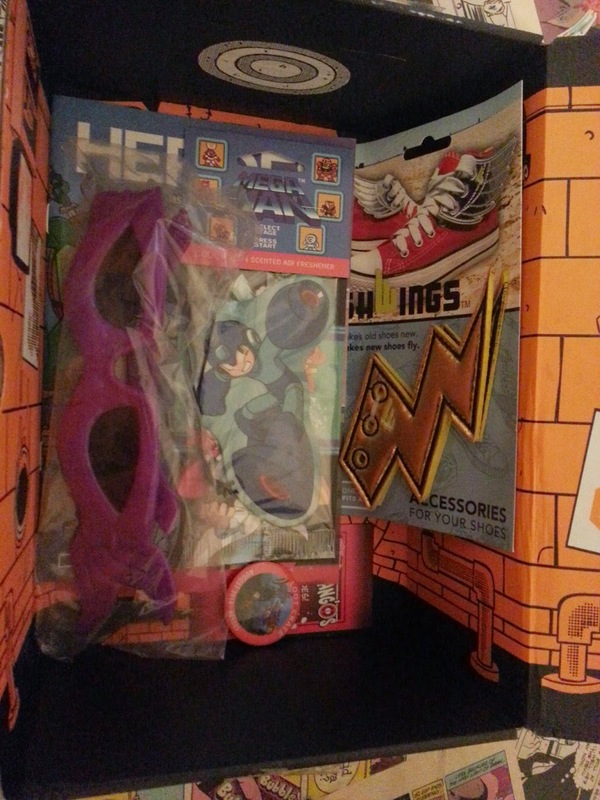 Other items included are a Deadpool magnet, some Shwings, a Mega Man air fresher, some DLC and the usual loot crate monthly badge and magazine. 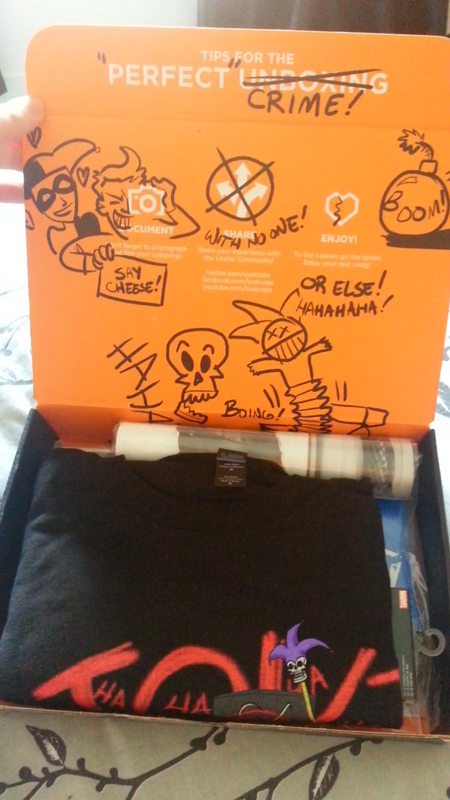 I love the inside design of the box this month, last months was made to look like it was drawn on in a graffiti style but this month its all printed in a Turtles scene, they have said on twitter that next months crate will also have a printed box. To me this is an extra bit of excitement in the box. Overall I feel like this months HEROES crate wasn't on Parr with last months VILLAINS crate although the Groot exclusive is amazing I am disappointed there wasn't a Superhero item, for example Batman, Avengers, X-Men etc. The crate was more of a not the predictable HEROES crate but I wanted a predictable heroes item. 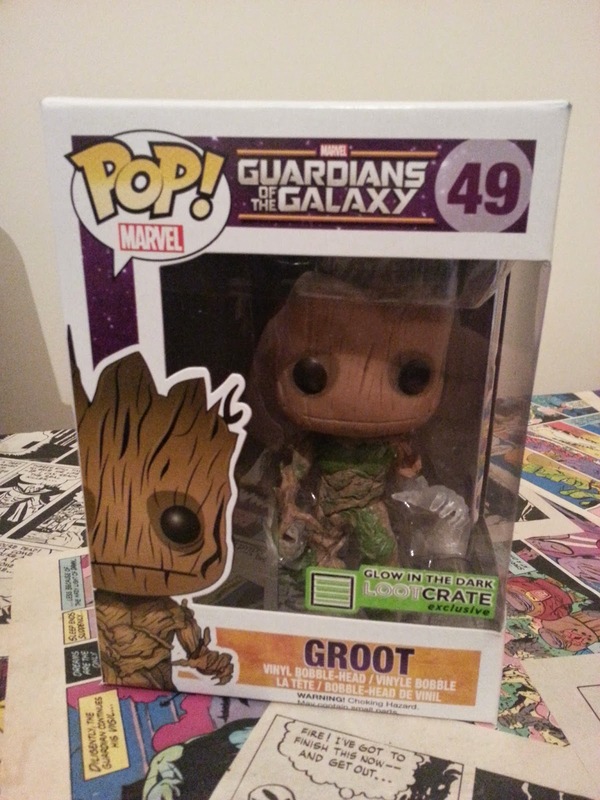 So I suppose the crate wasn't what I expected, however for £18.00 I would of paid that for the exclusive Groot so I'm still happy and I am going to keep my subscription with Loot Crate and I look forward to next month's. Little note on next months crate, Loot Crate tweeted saying that they had shot the monthly theme video in the desert over 3 days and it involved a canyon, 1st thing I thought of was a Star Wars theme but then the boyfriend say what about a Breaking Bad theme??? I got very excited at the thought of a BB theme and I'm impatiently waiting the announcement of Septembers theme! What's your ideas on next months theme from that hint? ?